The Sweeplings perform as part of last weekend's Red Lion Hotel at the Park concert series. The number of live shows available to Inland Northwest music lovers multiplies the moment it's warm enough to hang out on a patio. This summer, the Red Lion Hotel at the Park upped its outdoor concert game with free events every weekend through the end of August. That meant hiring a promoter to bring in better-known regional and some national talent, and building a brand-new vaulted stage. "In its 40 years, this hotel has had such a connection with so many people," says general manager Michael Fear. "Through music, we're trying to bring the community in once again." 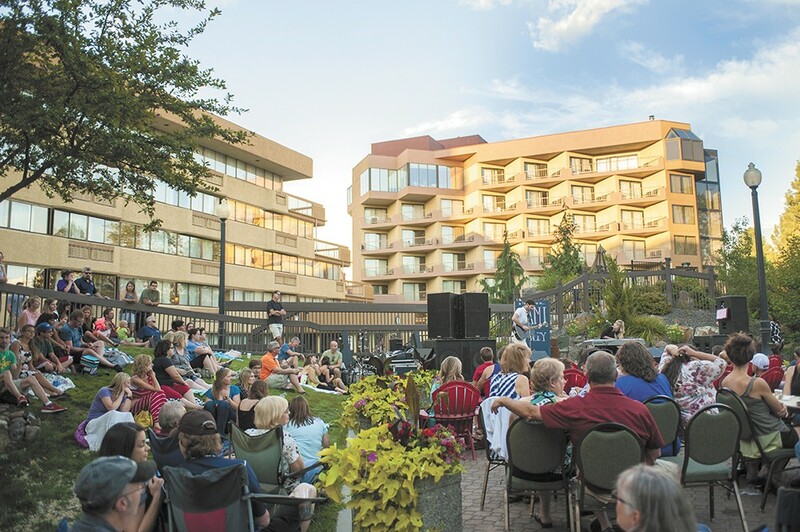 Right off the Spokane River Centennial Trail and idyllic Riverfront Park, the hotel's stage sits between the upper bar patio and pool, beckoning passersby to stop and take a breather on the lawn or concrete patio. In years past, the hotel has hosted singer-songwriters on its outdoor bar patio; they've already brought in acts like the Sammy Eubanks Band, Hey! is for Horses, an Eagles tribute band, and last weekend, Cami Bradley's new act, the Sweeplings. Fear says that each weekend has been better attended than the last, and the music has caused more than one hotel guest to come out and dance on their balconies. This is all part of a new direction for Red Lion Hotels, which is expanding all over the country. Red Lion Hotel at the Park is undergoing a complete renovation — including a climbing wall in the lobby — and is poised to change its name to Hotel RL soon. Fear is working to make this transition as smooth as possible. In Spokane for the past 17 months, but in the industry for 30-plus years, he says the idea for the concert series wasn't hatched until April. The first show scheduled out of the gate in early June, featuring the Oregon-based Cherry Poppin' Daddies (of "Zoot Suit Riot" fame), had to be canceled as the large, box-shaped, uncovered stage wasn't yet completed.